The 2007 Worldwide Partner Conference, better known as WPC07, a computer industry gathering, took place in Denver, CO from July 10-12. 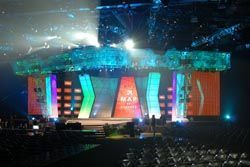 Twelve Martin Maxedia digital media servers were used to provide digital content to a remarkable 36 plasma screens, two LED curtains and center LED Wall. "We used a Matrix Preview monitor so that I could preview all outputs during programming, rehearsals and show," commented Thomas Walls, Maxedia and Maxxyz programmer at Stardust Productions. "The networking was a godsend. I was given custom content what seemed like every hour or so and with 12 servers online, the networking made my life a breeze." When all was said and done, approximately 68 gigabits of custom content was used on the show. Mike Amelang of Flying Spot created custom content on-site, which Thomas immediately loaded into the Maxedia systems. Several other types of custom media were also incorporated. "Once we had the system up and running, we had no issues at all during the 8 days on-site," Thomas says, noting that all Maxedia's were running Version 68 which was technically beta at the time of programming and show. "I was really ecstatic with the performance and response of the Maxedias. They all stayed in sync and produced exactly what the client was looking for." "We used a gigabit network which allowed us to load custom content on the fly and be able to play it back almost immediately as the client was requesting," says Thomas. "Mike at Flying Spot did a great job of providing the custom content. Also, Curtis Cox of Steve Cohen Productions came out during the first few days to help in setting up the system. His expertise on the Maxedia was very helpful and certainly made the installation and configuration of 12 servers very easy." The 12 Maxedia servers were provided by Stardust Productions, Steve Cohen Productions, Frontlight, and Martin. The Maxedia effects were run through a Maxxyz lighting console provided by Stardust Productions, Scenery for the event was by Greg Elder, senior designer at The Production Network, Seattle.